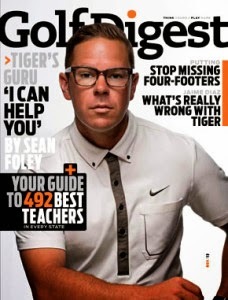 MOST OF US DON'T KNOW SEAN FOLEY, but I suppose it's easy to have opinions about him because he worked with Tiger Woods. And we've all had our fill of Tiger since the mid 1990s. There are a lot of Tiger experts. I still don't understand why Tiger did such an extensive swing overhaul with Foley. I figure it had a lot to do with building something that would protect the knee. Tiger's line about getting better was, and is, tiresome. You don't get better at his age, especially after what he achieved from 2000 to 2008. No one has had a run like that. Still, I don't think Foley is the bad guy, or to blame, for Tiger's decline. There have been many factors. As others have pointed out, Foley has some other thoroughbreds in the coaching stable. To name two, The Barclays winner Hunter Mahan and 2013 U.S. Open champion Justin Rose. Those fellas have fine golf swings. I like this snippet from Foley in a 2011 Golf Digest "My Shot." I think Foley is right on. So, it makes me wonder about all the swing talk, the mechanics and such. It often seems to me that Tiger and other players get so focused on technical issues that they forget they're playing a game, swinging a club, walking a course. At a younger age, they just hit it, found it, hit it again. They swung the club with feel and athleticism. They played golf, not golf swing. These golf and swing coaches ... aren't many of them enabling this nonsense? Foley included? That's the way it often looks to me. Neil--well said. There was a time when Hagen and Hogan and every pros from Tommy Aaaron to Fuzzy Zoeller played the game with just a caddie on the bag. Now they walk the course with a choir of 'advisors,' from swing coaches to PT instructors. If guys like Snead and Demaret were around they'd be rolling their eyes at what has happened to their game.